The usual rule of thumb is to keep two-seconds distance, with variations of three and even four, and sometimes corrections under bad weather. I do not have any problem with two-seconds rule as a baseline, as long as you realize that it is just a rule of thumb, imprecise by definition. Three and especially four seconds for the baseline do not make me happy as an over-protection that tend to bring in side effects and over-complicate the things without any real benefit. Such distances are usually unsustainable in heavy traffic - ALWAYS somebody is going to jump in front of you, if you keep three seconds distance, let alone four. If you follow the usual advice and try to increase the distance again and again, you and drivers behind you are going to get frustrated pretty soon. Frustrated driver is impaired driver, and the odds of accident happening to you skyrocket. 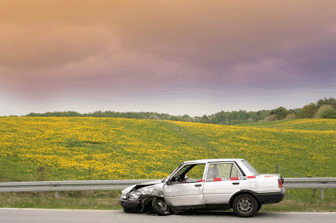 Since defensive driving is all about decreasing the odds of accident, three-four seconds is not the way to go. Also, the fact that you can't realistically keep such a distance means that your level of concentration should be higher when traffic is heavy - nobody is going to let you have a distance that will compensate for your inattentiveness. I'll talk later about safe distance dependence on your focus. The distance needed to stop your car consists of three parts. First is the distance your car travels while you notice the problem and you realize you should apply your brakes (your reaction time). Second is the distance that brakes need to stop your car - actual stopping distance. The third part is the distance your car travels between the moment you finalize your decision and the moment you actually start to push the brake pedal. You use this time to release the gas pedal and transfer your feet to the brakes. Let's call it transfer time. Driver's shape, skills, and level of concentration all do affect reaction time. This is pretty much straight forward - the better you feel physically and mentally, the more experienced you are (to some extent), and the more focused you are - the shorter distance you can keep without any problem. Your reaction time improves while you grow from the novice to the average driver, and at some point you no longer need to think about applying your brakes - it becomes an instinctive act. From now on your reaction time does not improve any more - that's why I said that experience plays its role to some extent. Well, this refers to simple situations. The more complex the situation is, the more practice is needed to convert related decision process to instinct. So, to some extent experience will continue to improve your average reaction time during your whole driving life. Experience affects your transfer time, too. And transfer time depends purely on a skill level that you can improve endlessly. Of course there is a law of diminishing returns; and after some level of skill is achieved here, it is much easier to keep a tad bigger distance than to improve that skill further. Unless for some reason you just want to perfect it. Your physical and mental shape is a very important factor. My last (and the only one during the last dozen years) accident happened because I was heavily jet-lagged. My reaction times went bonkers, my decision making process was sluggish, and I just did not have enough time to dodge the lady who made a left turn from the right lane. If I were in a good shape, the same amount of time would have been a plenty to avoid collision, and this crazy lady would have continued her way, and I wouldn't probably even remember her after a few minutes. It's not exactly about distance, but it illustrates the point why your shape is important in choosing the safe one. Your level of concentration is another biggy. Cell phones, email, talking to passengers, music, smoking, eating, drinking, doing makeup, reading, looking at the map, thinking about your divorce, watching movies, playing trumpet� And million other big and small distractions. All those things just kill your reaction time. You need to leave yourself room for error. If you can't increase the distance due to heavy traffic, you need to pick between driving and whatever distraction you have at the moment. Either stop playing trumpet or stop on the shoulder until you are done with trumpet. Level of concentration goes hand in hand with your current driving style, too. Current means how you are driving right here and now. For a sake of simplicity, let's say there are three possible styles: relaxed, normal, and active. Two-second rule belongs to the normal driving style, something that you do every day. When you are relaxed (sightseeing for example), your level of concentration is low, your mind works slower, and you don't want sudden surprises. They will break your relaxed state. So, you leave yourself more room to react - means bigger distance. The more relaxed you are, the bigger distance should be. Sometimes it is not possible to maintain the distance you deem safe. This is the signal to you to either exit your relaxed state and increase your focus on driving, or to stop your car and try to relax on the shoulder. When you are active (not to say aggressive), you often want the shortest distance possible in order to be able to swerve between other cars and get to the open space. While they don't teach you this on defensive driving courses, it can be done safely, but it requires the highest level of concentration. You can literally sit on the rear bumper of another car for a few moments without any consequences, but you have to be 100% focused on your driving to be able to do so. And your shape and skills should be close to perfection, too. Overall, the required level of concentration on driving is in inverse proportion to the distance to the car in front of you.. The closer you follow, the more focused you have to be, all other things being equal. If you can't maintain enough focus - increase the distance. As easy as that. There is no way around, and this is one of the fundamental laws of defensive driving. Now, does the distance depend on road conditions? Many drivers (and instructors) think it does. They do not consider the fact that your car needs approximately the same space to stop as the car in front of you. In any weather. At least this is applicable to the vast majority of cars excluding possibly heavy trucks and antiques. The stopping distance for a given road conditions is about the same among all the cars on the road - assuming the skill level of all drivers is about the same, too. That means that the popular advice to vary the distance to the car in front of you according to the road conditions seems to be not that smart - another car stopping distance increases about the same amount as yours, right? Well, there is a twist to that. If you have to ask those questions, your skill level is most probably not very high. And if the driver in front of you has much better braking skills - yes, you need to increase the distance. Bad weather is exactly when braking skills do make a difference in stopping distance. I do not have that problem, and I do not have to compensate for other drivers' better skills - cause my skills are among the best ones around - and this allows me not to increase the distance in such a case. You have to assess your braking skills honestly, and decide accordingly, and it is always better to err on the side of caution. And - sometimes you still want to keep a bigger distance in the rain or snow because of visibility problems. Yes, you need more reaction time if you can't see clearly what's going on in front of you. All this puts adverse road conditions in the same bucket as driver's skills, shape, and concentration level in terms of the distance you need to maintain. As soon as you experience ANY of those being worse than usual, you need to increase the distance, sometimes dramatically. When I have to drive being sleepy or drunk (professional driver on a closed course - don't try this at home LOL) I keep the distance SEVERAL TIMES more than my usual couple of seconds. I have a separate article (with pics!) about the distance at stoplights, so I'm not discussing those issues here. In many countries, and in some states in the U.S., the minimum recommended following distance is 2 seconds. In other states, it is 3 seconds. I prefer 3 seconds and, if traffic conditions permit, more than 3 seconds. In light traffic, there is no point in maintaining only the minimum following distance. If traffic is light and there is no reason not to, why not follow at 5 or more seconds? Two seconds is adequate only if you are able to keep your eyes continuously focused on the brake lights of the car ahead, and that is impossible since there are also other things that safety requires watching. If everyone followed at more than 3 seconds when possible, lane changing would certainly be easier. It can be very difficult to change lanes when everyone is following at the minimum legal distance. Although it is true that when the road is slippery, the ability of the car ahead to stop quickly is also diminished, there are other considerations. If the car ahead stops extra quickly as the result of an accident, then if you have not allowed a greater following distance to compensate for road conditions, you are more likely to become involved in an accident. For example, a car may run a read light or go through a stop sign at a blind intersection, and the car ahead may run into it causing him to stop much more quickly than tire traction would permit. I suggest u to keep a fare level of distance to the car infront of u. KEEPING a minimum of 5 secs distance is a must, it will surely give you time to steer to safety if any mishaps occur. Quite so, when traffic conditions permit it. A greater following distance also makes it possible to maintain a more even speed to get better fuel mileage and reduce wear and tear on the car. I find that when the driver in front of me applies the brakes, often all I have to do is close the throttle. Of course in heavy traffic, one cannot maintain as great a following distance. But surely in light traffic, there is no advantage to maintaining only the minimum safe distance. Minimum 5 seconds is a must? Do you drive at all, or you just read books about driving? Oh Sindhu, you are killing me. Did you ever try to keep a 3 feet distance at say 60 mph? A minimum following distance of 5 seconds would often be impractical, although in light traffic it would be fine. In heavy traffic, if everyone maintained a minimum following distance of 5 seconds, many roads would be unable to carry the necessary volume of traffic. Also, other drivers would be constantly cutting in. The 3-second rule seems to be what works the best in good driving conditions. I don't need to say, but I shall say it anyway-- during bad weather conditions, rain, snow, fog, the three seconds need to be increased for safety sake. Six or more seconds during light rain, snow and fog, and maybe nine or more during heavy rain, snow and fog. The safest distance which should be between two cars is 10 feet....To avoid accidents the above mentioned is the best one.